Are you acting as designated driver, not drinking alcohol or looking for a tasty non-caloric mocktail or a sweetener-free soft drink? An enhanced glass of club soda is a delicious drink, inexpensive to make and virtually calorie-free. 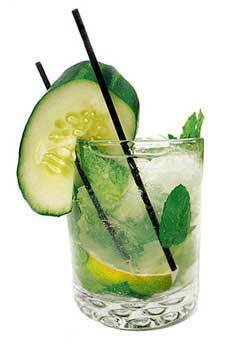 Cucumber* slices, both thinly sliced in the glass and as a thicker wheel for garnish. Mint leaves, gently crushed to release their flavor. Other fresh herbs: rosemary and thyme sprigs or basil leaves. Bitters:† Add a little or a lot, depending on how intense you like your flavors. *Botanically, the cucumber is a fruit. How to tell the difference: Vegetables drop their seeds externally, whereas fruits contain their seeds inside. Cucumbers and squash, e.g., are botanically fruits, not vegetables. The strawberry, known as the only fruit with seeds on the outside, is actually an accessory fruit, and not a true berry. The seed-like achenes on the outside are actually the fruit; the fleshy part develops from the receptacle, an edible part of the stem. Refreshing and virtually calorie-free. Photo courtesy Jaclyn Nussbaum Photography. †The familiar Angostura bitters are distilled from an herb called gentian, the flavor of which resembles ginger. Artisan-distilled bitters have become very popular over the last few years. Fee Brothers, for example, makes bitters in 12 flavors, from cranberry and grapefruit to chocolate. English scientist Joseph Priestley discovered the process of infusing water with carbonation in 1767. Inspired by the bubbling in beer vats, he suspended a bowl of water above a beer vat at a local brewery in Leeds, England. But he did not commercialize the process. That was done by businessmen such as J.J. Schweppe, who founded the Schweppes Company in Geneva in 1783 based on Priestley’s discovery. Carbonated water is a generic term for any effervescent water. Club soda is the modern term for soda water: carbonated tap water with added salts for flavor. Seltzer is a former trademark from the German town Selters, famous for its mineral springs. The naturally carbonated water has been commercially bottled and shipped for centuries. In the U.S., “seltzer” has evolved into a generic term for tap water that is carbonated without the addition of salts. Soda used to refer to soda water (see below). In the post-World War II U.S., it has come to mean any type of sweetened, carbonated soft drink. Sparkling water, a term regulated by the FDA, is a spring water or mineral water that must come from its source naturally carbonated, although carbonation that is lost during processing can be added back artificially. During the Great Depression, soda water (today’s club soda) was also called “two cents plain,” the cheapest drink at soda fountain. One could enjoy an egg cream for twenty-five cents (seltzer, chocolate syrup and milk). Chocolate milk (chocolate syrup mixed into milk) was a dime. A chocolate soda (chocolate syrup mixed into seltzer) was a nickel. And if you only had two cents, your drink was a club soda.